Today it’s been two weeks since Sweden enacted the IPRED law that makes it much easier for industry organizations to prosecute individuals involved in illegal file sharing and piracy. So at Pingdom we decided to examine the effects so far, looking at broadband traffic and online sales. Right after the law came into force on April 1st, the Swedish national broadband traffic dropped dramatically from an average of 160 Gbit/s to about 100 Gbit/s. If this is due to a reduction in illegal file sharing is disputed, but no other credible explanations have been offered for this event. 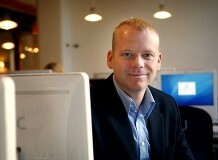 Researchers, file sharing representatives and others have contended that this is likely only to be a temporary effect. In Finland, for example, broadband traffic also dropped after the implementation of the EU Ipred directive into national law, but today file sharing is back up and more common than ever. 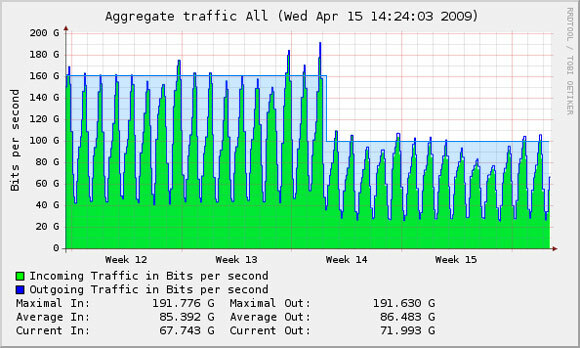 Above: Traffic data from the Swedish IXP Netnod. Note the significant traffic drop on April 1. Well in Sweden so far, the national broadband traffic levels through the Internet Exchange Points have failed to increase, they lie steadily at about 100 Gbit/s. Unfortunately international traffic data are not so easy to come by, and we can’t determine if Swedish cross-border traffic has been affected. So the story has at least two endings. Either the legal media download sites improve and offer good enough terms for most of the consumers to choose this path, or considerably large parts of the internet traffic will become untraceable as consumers start using more powerful solutions to mask file sharing activities. The large Swedish BitTorrent tracker The Pirate Bay has already received 113 000 requests for a beta invite to its new VPN-service IPREDator, due to launch soon. The VPN-service will hide the origins of its users making it hard for the anti-piracy organizations to trace copyright violators. Regardless of all else, file sharing technology will continue to evolve rapidly. We just have to hope that the legal alternatives will develop faster, offering bigger, better and more affordable services that are more attractive. What do you think will happen? What do you think should happen? Sources: Swedish IXP Netnod, SvD – Internet traffic dropped, IDG – A rush to Gamers Gate after the IPRED-law, Aftonbladet – Pirated copies out of fashion after IPRED-law, SF Anytime, Stockholm University – IRI, DN – Pirate Bay hides 100 000 file sharers. Great follow up on this matter. in the end we always win! What surprised me during this whole ordeal, especially involving The Pirate Bay (TPB), was their inability to see that all this file sharing is wrong. They don’t take responsibility and act in a very childish way, an example being this “IPREDator” you speak of. They claim that the music/film etc. industries don’t need anymore cash, and they’re offering free advertisement for these companies by downloading their stuff. How would a basement geek advertise to his other geek friends who also don’t buy anything? It’s not just about them. The little people lose out, all those store owners and online shops trying to make a living. Unfortunately I think file sharing will continue growing unless the media companies restructure how they work. The file sharing services cannot continue to claim ignorance to the 99% of illegal stuff on their networks. They’re making money from these sites so should pay staff to moderate, or be shut down.